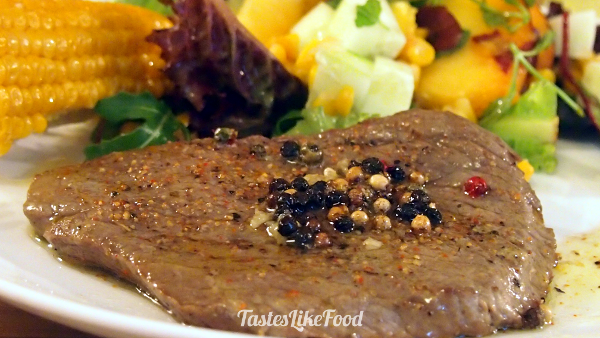 We tried the pepper steak for the first time in Republica da Cerveja in Lisbon. We liked it so much that we wanted to find it around where we live, but in vain. We managed to find a similar steak but it was served in a creamy pepper sauce, which is very different from the olive oil and butter sauce and not as tasty. But hey! Why not just do it at home instead? Minute Steaks need to be fried quickly so that they don’t turn tough and dry. You can eat them with a side salad, potatoes or just on a slice of bread. They are easy to get from the butcher and are usually cheaper than other types of steaks. (For geeks, a geeky link for further research 🙂 ). For this steak, as for all steaks in general, coarse and freshly grounded spices make all the difference. 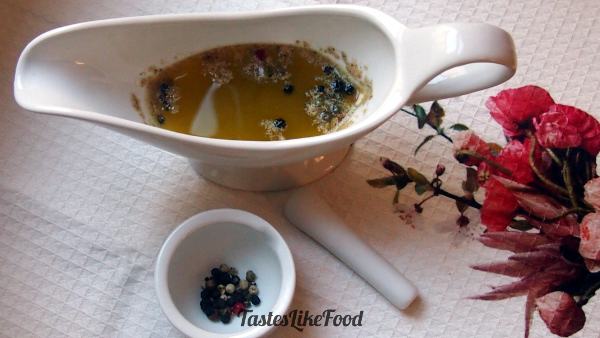 If you don’t have at home a mortar and pestle, you can simply replace it for this recipe with a tablespoon, crushing the pepper against a chopping board or a plate. Sprinkle course salt and 1 tsp of freshly ground mixed peppers over the steaks. Set aside for 5 min. In the meantime, prepare the pepper sauce. In a small saucepan melt the butter. Remove from the heat, add the extra virgin olive oil, and stir. In a mortar and pestle crush slightly the remaining 4 tsp of mixed peppers (do not overdo it, the point is to release the aroma of the pepper, not to grind it completely). Add the pepper and the garlic salt to the olive oil and butter. Preheat the prepared sauce on medium heat, do not bring to a boil. Set aside. 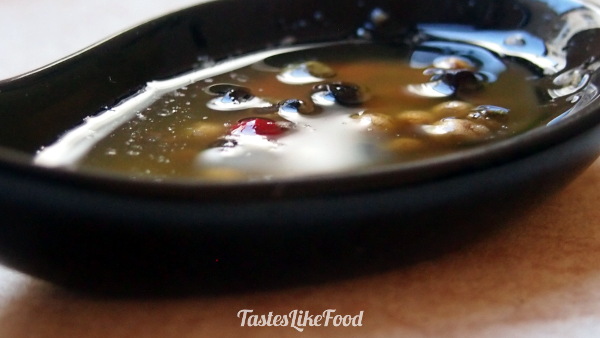 Pour 4 Tbsp of sauce onto a frying pan. Once it's hot, fry the steak on medium to medium-high heat 0,5 minute on each side. Serve immediately with the rest of the pepper sauce.